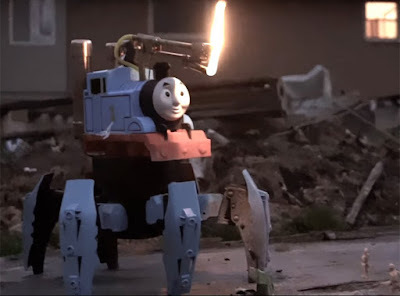 In retrospect, Thomas the Tank Engine was always a little creepy, what with all those unpaid, un-praised limbless mechanical creatures striving so viciously to be "really useful engines". However, we would gladly take the criticism of a fat man in a top hat all day if it meant we never encountered this six-legged, fire-spitting version of Thomas. Created by Peter Sripol, who used to work with one of our favourite YouTube channels, Flite Test, this modified spider robot toy has been given a Thomas the Tank Engine make-over... and then given a Hell beast make-over, too. The toy's internals were souped-up to make them more rugged, and - obviously - the flame thrower was added into the mix to make it the perfect toy for any child this Christmas. Joy!